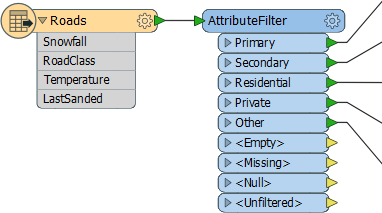 The Tester and TestFilter are not the only useful filter transformers. Is that road a Primary , Secondary, Residential, Private, or Other type of road? Is the forecast for sun, rain, snow, or fog? In this example features are divided into different postal codes depending on the value of a PostalCode attribute. If your workspace looks like this then an AttributeFilter transformer might be a better option. In this transformer the only "operator" is to find equivalency, so you would rarely use it for arithmetical tests. 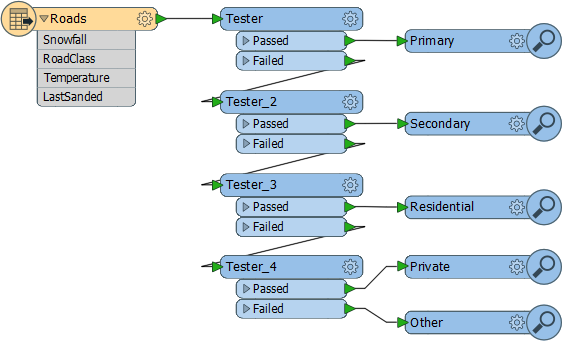 If the Tester, TestFilter, and AttributeFilter all filter features on the basis of an attribute condition, then what’s the difference? When would I use each? The AttributeRangeFilter carries out the same operation as the AttributeFilter, except that it can handle a range of numeric values instead of just a simple one-to-one match. 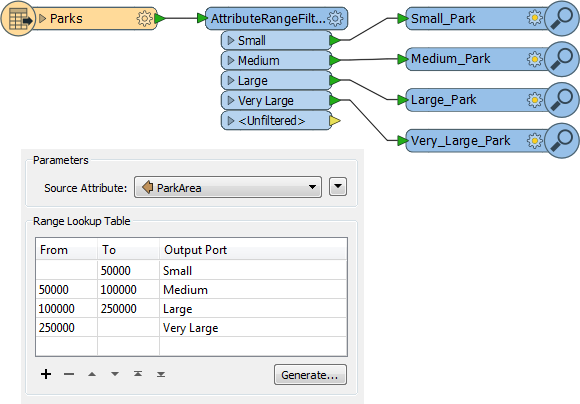 The AttributeRangeFilter parameters dialog has the option to generate ranges automatically from a set of user-defined extents. The GeometryFilter (#15 in the top 25) directs features on the basis of geometry type; for example, point, line, area, ellipse.